Background: Vitamin B12 deficiency is prevalent in many countries of origin of refugees. Using a threshold of 5% above which a prevalence of low Vitamin B12 is indicative of a population health problem, we hypothesised that Vitamin B12 deficiency exceeds this threshold among newly-arrived refugees resettling in Australia, and is higher among women due to their increased risk of food insecurity. This paper reports Vitamin B12 levels in a large cohort of newly arrived refugees in five Australian states and territories. 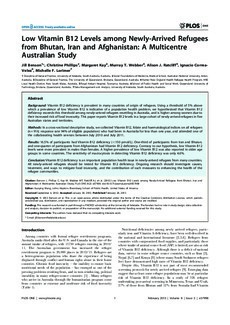 Methods: In a cross-sectional descriptive study, we collected Vitamin B12, folate and haematological indices on all refugees (n = 916; response rate 94% of eligible population) who had been in Australia for less than one year, and attended one of the collaborating health services between July 2010 and July 2011. Results: 16.5% of participants had Vitamin B12 deficiency (<150 pmol/L). One-third of participants from Iran and Bhutan, and one-quarter of participants from Afghanistan had Vitamin B12 deficiency. Contrary to our hypothesis, low Vitamin B12 levels were more prevalent in males than females. A higher prevalence of low Vitamin B12 was also reported in older age groups in some countries. The sensitivity of macrocytosis in detecting Vitamin B12 deficiency was only 4.6%. Conclusion: Vitamin B12 deficiency is an important population health issue in newly-arrived refugees from many countries. All newly-arrived refugees should be tested for Vitamin B12 deficiency. Ongoing research should investigate causes, treatment, and ways to mitigate food insecurity, and the contribution of such measures to enhancing the health of the refugee communities.